The Rio Women’s Sandal from Birkenstock is a design that I definitely recommend if you’re looking for an everyday footwear option that maximizes comfort and casual style. After having been released into the market just a little less than a year ago, the design got a lot of attention from avid Birkenstock fans and new patrons alike, so I couldn’t pass up the chance to review the sandal. 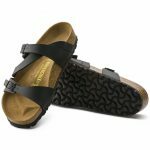 I raked through the web to find all the information I could on this popular design, and all I can say is that it definitely delivers what you expect out of a Birkenstock brand sandal. 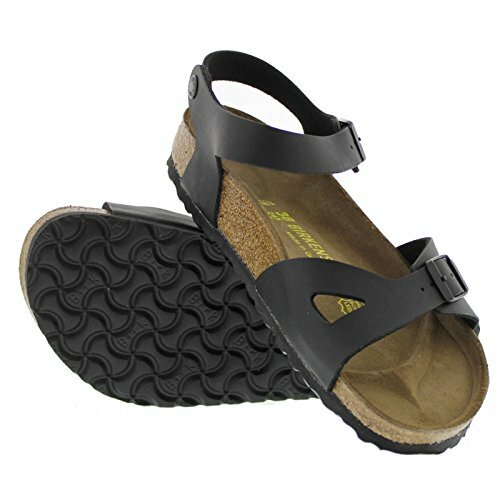 So what exactly is it about the Birkenstock Rio that has won over the hearts and positive reviews of countless buyers? Find out here. The first thing I want to talk about with the Rio is its appearance. At a glance, you can definitely tell that it’s a Birkenstock sandal. The Birko-Flor straps combined with the cork footbed exudes that classic Birkenstock appearance that we all know and love. Unlike the Arizona Sandals from the same brand, however, the Rio uses a more secure strap design that ultimately sets it apart from other Birkenstock options. Instead of having straps that just cross over the width of the sandal, the Rio has a strap that secures around the ankle. This strap design results in a more stable fit, preventing the sandal from flying off of your foot. For that reason, some people have used their Rio sandal for outdoor activities like light trekking and hiking over paths that aren’t too demanding. Of course, as with any other Birkestock design, the Rio comes in a number of different colorways to cater to varied senses of style. The most common are the black and white Birko-Flor straps, but there are many other choices that use a variety of fun colors and patterns. If there’s one thing we all love about Birkenstock sandals, it’s their footbed. The subtle cork construction incorporates several different well thought-out design features. 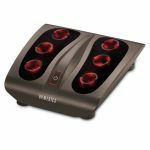 It’s this intuitive topography that makes it one of the most comfortable footbeds on the market. That’s also why the Birkenstock Rio makes a great everyday footwear choice for getting around the town or running errands. The footbed uses an Ekte Skinn insole which is flexible, breathable, and gentle. 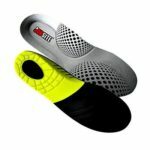 The purpose of the insole is to give your foot a soft surface that reduces friction and moisture accumulation so you can comfortably get around sans the chances of blisters and damaged skin. The midsole is made from cork which offers just enough responsiveness to reduce impact and give your step a little extra bounce. But aside from giving your feet a sufficiently bouncy surface to conserve momentum, the Birkenstock Rio cork midsole also features a unique anatomy that makes it perfect for all kinds of feet. Different cups and contours over the surface of the cork help properly accommodate your feet for a comfortable walking experience. Along the heel area is an extra deep cup that rises towards the arches to support the natural shape and anatomy of your foot. Towards the front of the sandal, a raised toe bar helps keep your foot in place, preventing the need for your toes to squeeze against the sandal to maintain its position. A raised border at the front-most edge gives greater space for your toes so you can effortlessly maintain your natural foot position for unbelievable long-term comfort. Finally, the straps are made from the signature Birko-Flor material with the same fleece lining used for other sandals. This makes them very smooth to touch, so they don’t rub against the skin or cause blisters or irritation. Yup, you read that right. Despite having a buckle around the strap area, the straps don’t actually adjust. So the comfort that the Rio offers is limited to those who actually fit the pre-adjusted straps. This becomes particularly problematic with the strap that secures around the ankles. Lots of buyers who purchased the Rio online ended up having to return or exchange the design all together. Mostly, the complaint was that the ankle strap tends to run larger than the rest of the sandal’s size. With that in mind, it might be best to consider actually see the sandal in person first before actually going out to purchase it for yourself. 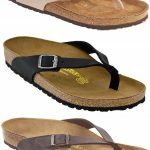 You could also opt to check out other similar Birkenstock designs like the Yara which allows users to adjust the straps to achieve a better, more customized fit. If you’ve ever had a pair of Birkenstocks before, you probably already know how short their outsoles’ lifespan can be. Unfortunately, Birkenstock seems to fall short when it comes to extending the life of their treads. With the Rio Sandal design, that remains to be true. The outsoles feature EVA material which helps the design maintain its lightweight and flexible construction. Sadly, this sacrifices a lot of resilience, especially because the Birkenstock brand is often a go-to option when it comes to everyday footwear. EVA outsoles easily wear out, and treads can disappear in as short as just a few months. This saps the Rio of its traction, and makes it a hazard to walk in. Over wet or smooth surfaces, it does become something of a danger. It’s worth mentioning though that Birkenstock seems to be aware of the problem. That’s why they offer sole repair services for their designs. The cost is a lot more affordable than buying a whole new pair altogether, so it does work to rectify the issue. Of course, I think it would have been much better to just use a harder wearing material to begin with. Nonetheless, the services are pretty easy to avail of and they do offer reasonable prices for replacements and repairs. So it does work well enough to extend the lifespan of your Rios in case of tread wear and tear. Aside from the treads, there’s really not a lot I can pick on when it comes to the sandal’s construction. All things considered, the Rio sandal from Birkenstock is probably one of the most durable designs you’ll find. Superb craftsmanship connects the uppers to the footbed. So there’s no need to worry about the straps wearing out and falling apart. The entire construction looks seamless and clean, without a hint of a stitch where the materials come together. Despite that, everything fits together securely and perfectly. This allows you to step in confidence minus the fear of the design losing integrity over time. That said, the Rio sandal definitely makes an ideal sandal if you’re in search of something you can use on the daily. Sure, the treads might need some repair after some time. But the rest of the sandal takes to wear and tear excellently, showing little to no signs of damage even after years of rigorous use. Impressive comfort thanks to the signature materials and construction used by Birkenstock across most of its sandal designs. Stylish, casual appearance makes it perfect for a number of different outfits. Secure strap design allows users to wear the Rio even during outdoor activities like trekking and hiking. Ultra-durable construction lasts for years without signs of wear and tear. Outsoles can provide sufficient traction on a number of different surfaces. Reliable after sales services can address issues with repairs and replacements. Treads may wear out after some time, significantly reducing traction. Strap buckles don’t actually adjust the straps. So the fit may be a hit or miss depending on your unique ankle size. Despite having a few design flaws, I can totally recommend the Birkenstock Rio. It makes a great everyday sandal that will see them through years of rigorous use. The Rio offers excellent comfort in combination with classic Birkenstock style. 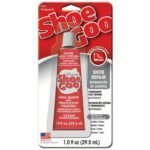 This makes it a smart choice if you want an investment for your feet. If you’re thinking twice because of the non-adjustable strap issue, I would recommend the Birkenstock Yara or the Daloa. Both of these boast a similar design to the Rio. The difference is that they provide the option to adjust the straps for a better, more comfortable fit.